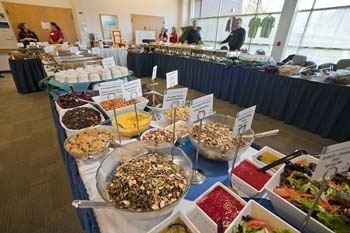 The Local Food Connection (LFC) is an annual conference connecting food producers (farmers, ranchers, fishermen) with area food buyers (grocery stores, restaurants, and institutions) through a workshops, networking sessions, and a vendor tradeshow. The event is a venue for creating new food business partnerships, learning about emerging market opportunities, and exploring local food issues. The LFC conference has grown immensely over the years and has become a “not to miss” event! The day is filled with a keynote address, networking session, workshops, and a fabulous local lunch. Please note that the Local Food Connection will not be held in 2018; we hope to see you again in 2019! The 8th annual Local Food Connection Conference for 2014 occurred on Monday, February 3 at Lane Community College in Eugene. This year the event focused was on distribution. It was a huge success that brought over 250 attendees together!To find out more information about the event workshops and presentations visit the LFC website.